The hotel was very clean and tidy we stayed in the newer appartments to the left of the main hotel with a fantastic pool and sea view. Only complaint no night life whatsoever. I stayed at the Yota this July 2006 ( very recent) with my 16 year old daughtr and 7 year son. We got there early hours and the hotel was locked up!!! However there was a note on the door stating which room we were staying in. So we lugged our luggage up and promptly fell asleep. Woke up a couple of hours later, I walked out on to the balcony the view is absolutely stunning of the beach and Aegean sea. 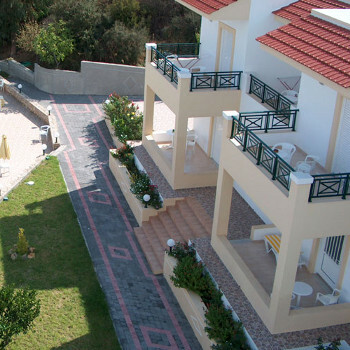 The hotel is in a very quiet part of Rhodes which is ideal for families with young kids. The breakfast is very plain (bread butter jam ham and cheese tea coffee OJ) take a kettle with you as none are provided in the hotel part. The pool is v. clean and safe, and plenty of sun beds. The staff are fab. George, the barman and waiter, the cleaner and the owners Tassos and his wife lovely. They work such long hours. The rooms are basic but lovely and cool with a huge ceiling fan and A/C but if you leave the fan on you don't need the A/C... the hotel rooms are very safe and secure. When my son was tired I used to put him in bed and go back to the bar. I left the patio door open so if he did wake up I would hear him. The evening meals where fabulous and the kleftico is to die for. If you want a bit more variety a taxi to lindos is 9 euros and 6 euros back to the yota. I would recommend this hotel and we are going back in June 2007 for a fortnight and I am very hard to please.